A range of pH testing instruments for a variety of applications. Our low cost pocket pH testers are ideal for hydroponics, swimming pools and field based and laboratory pH testing. The Thermometer Superstore range of pH testing equipment is easy to use and accurate. There is no need for litmus paper, just dip the pH tester into a liquid and read off from the pH level from the display. You can tell in an instant whether a solution is acid or alkaline. The pH Testers we offer have been chosen for their rugged construction and value for money. 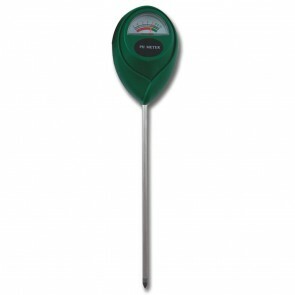 They range from low cost, simple, "needle pointer" instruments that are ideal for the keen gardener, to high specification, high accuracy digital testers from leading suppliers such as Hanna. PH meters and pH testers are suitable for testing industrial processes, swimming pool water, aquariums, hydroponic applications or for use in school laboratories.